Are you getting all geared up for Valentine’s Day?? It is just around the corner! Well if you are looking for inspiration today’s post has got you covered!! 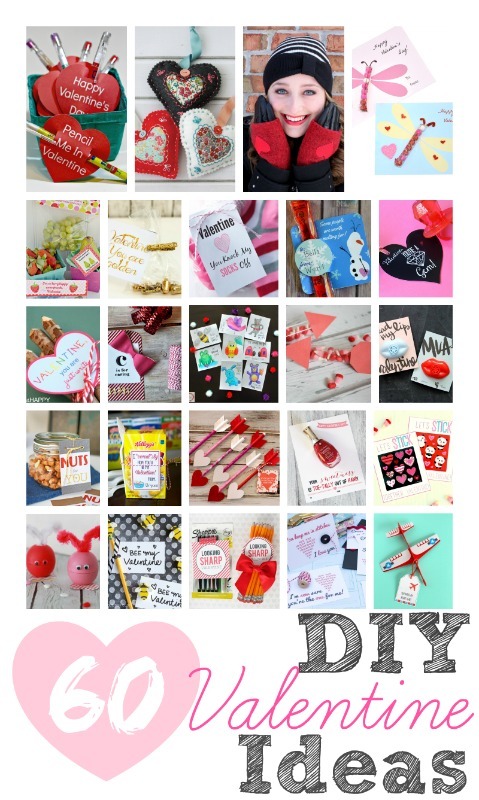 At the end of the post there will be links to at least 60 DIY Valentine’s day ideas!! There will be lots of options too – things you can do for kids, for your friends, and for that special someone too! But before we get to all that, let me show off what I made for you! 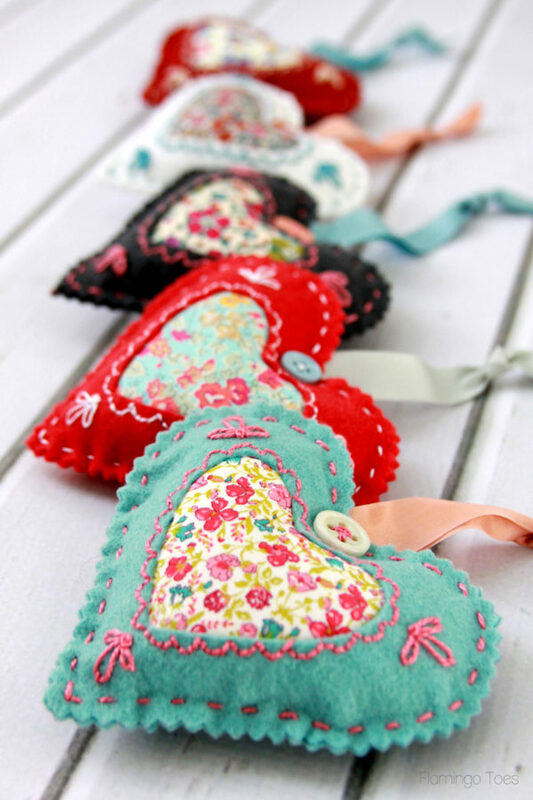 These sweet DIY Fabric Heart Valentines are perfect for giving to a friend or neighbor! They are filled with fiberfill and lavender so they make a great little sachet. You could pair them with a plate of treats or even just a handmade card and have a great gift! 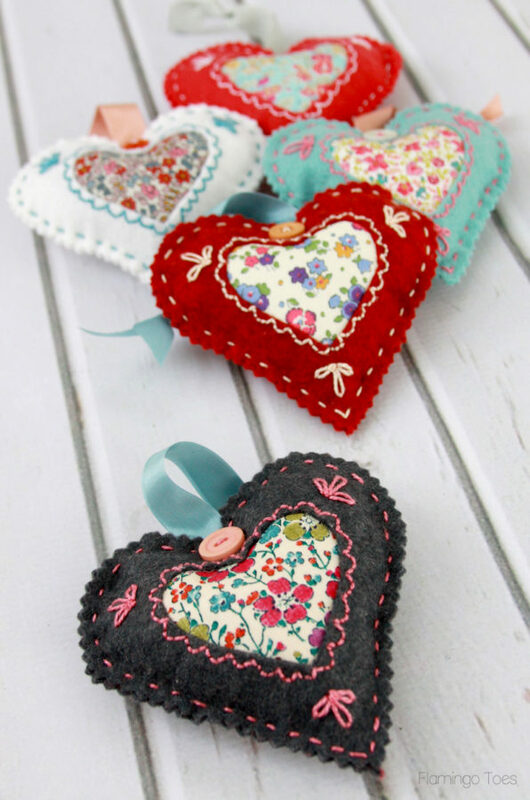 I dug into my precious Liberty fabric stash for these – I thought the hearts would be perfect for showcase these sweet fabrics! 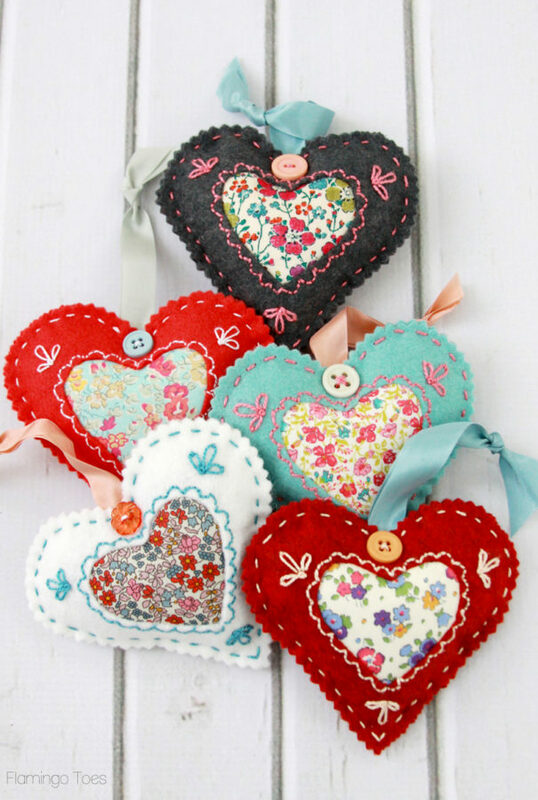 These are a great starter embroidery project and perfect for Scrap Busting too! Begin by cutting out your hearts from felt. If you use pinking shears you’ll have a nice zig zaggy edge. 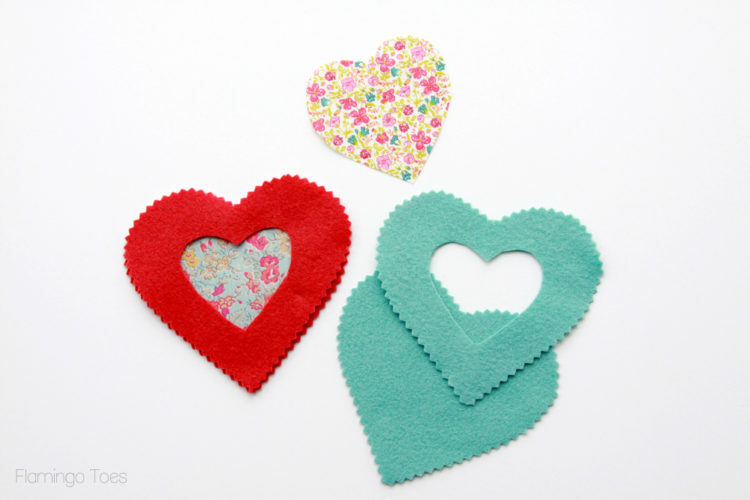 If you fold the felt in half and cut the hearts out at the same time, you can match up the zig zags when you sew them together and it will all look nice and tidy. Cut the center heart out of one of the felt hearts. Cut out your center heart (and optional lining). 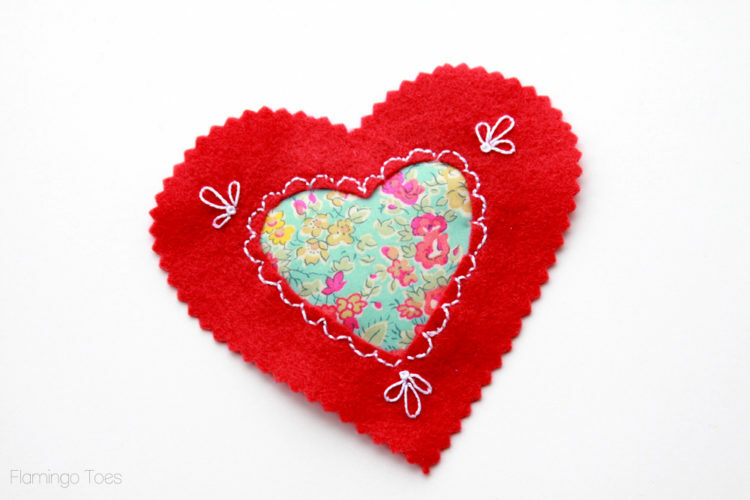 Cut small strips of fusible webbing and fuse the fabric heart to the felt. Fuse the lining fabric in place over the print fabric heart if you are using it. Make sure you use an ironing cloth over the felt so it doesn’t burn. 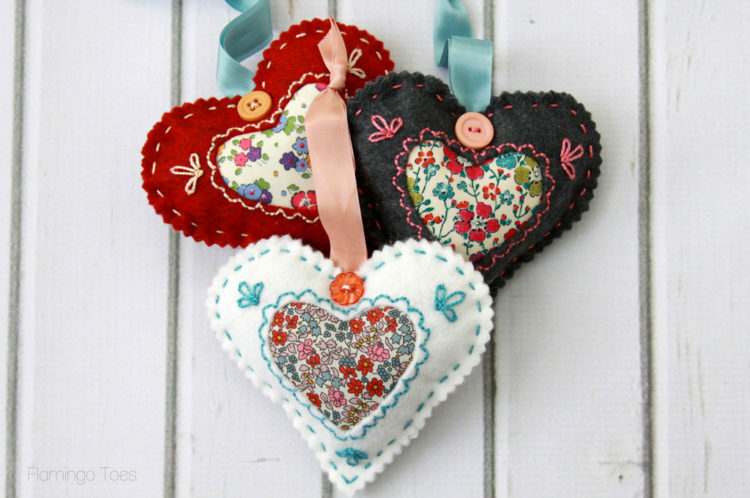 Embroider little scallops around the fabric heart on the front of the felt, using a back stitch. Add little lazy daisy loops at the bottom and sides of the heart. You can find embroidery tutorials on the How to Do That page. 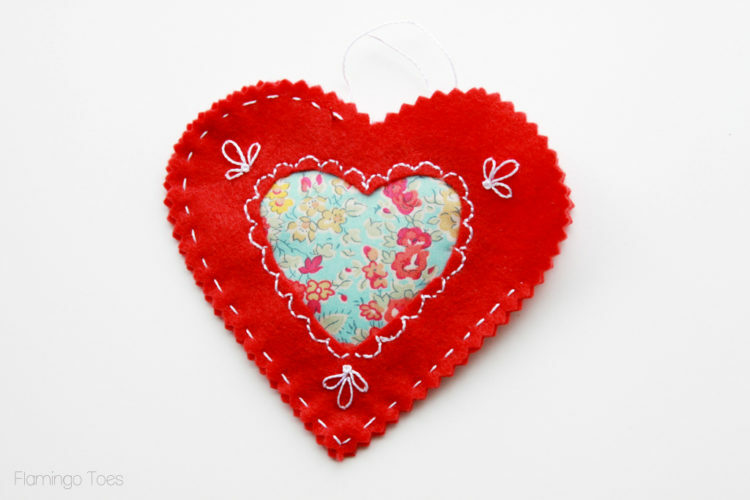 Place the front and the back of the hearts together and sew together with embroidery thread and a little running stitch. Leave a section open at the top and side. Stuff the heart with a little bit of fiberfill and some lavender at the center of the heart. Cut a length of ribbon and fold it in half. Tie a little knot at the end. 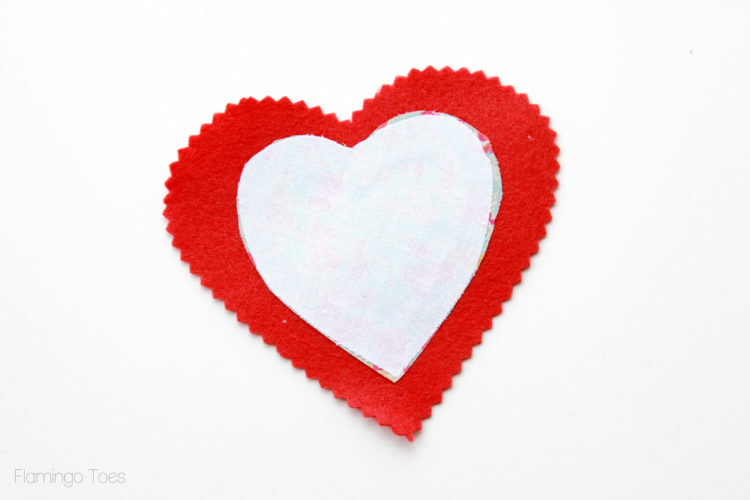 Place the folded end of the ribbon at the top of the heart between the two pieces, then finish sewing the two hearts together with the running stitch. 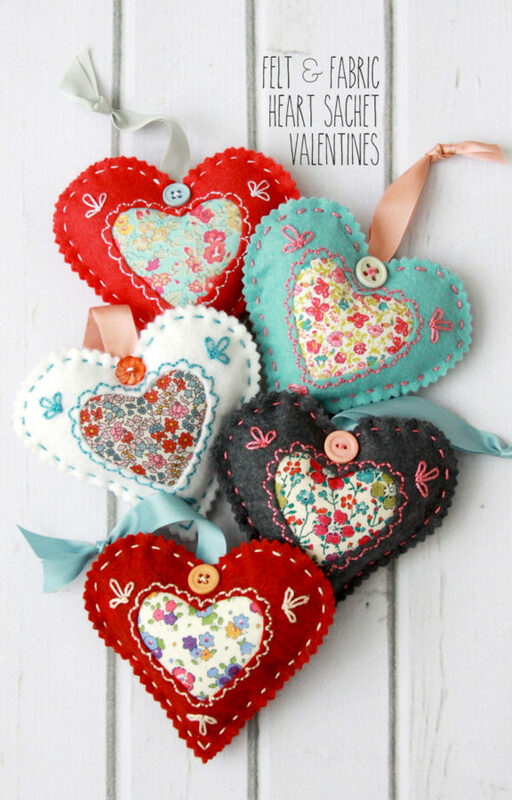 Sew a little button to the top center of the heart. I would have a picture for you of this step – but I forgot to take one. Being a beginner blogger and all. Ahem. But you can look at the finished photos to get the idea! Repeat the steps for a bunch of sweet hearts to hand out to your friends! And one for you too of course! Have fun checking out all the other projects in the Valentines Hop too! These are just beautiful, Bev! Your embroidery projects are always so cute. My grandmother loved to embroider; I am more of a seamstress, but I might have to try my hand at these. Thanks for sharing and for the Valentine round-up, too. Thank you for sharing this, such a pretty project. Now I have an excellent excuse to buy some Liberty fabric lol! These are definitely the best of the entire list. I can’t wait to start making some. Sadly I don’t have a Liberty fabric stash to dip into so mine won’t look as adorable as yours. 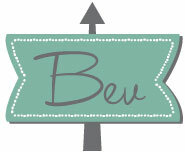 Oh, Bev, these couldn’t be any sweeter. I will definitely be making some of these. Thanks for the tutorial. Good grief, Bev, your Valentine hearts are just too precious for words! Thank you for sharing the tutorial, but I would be so depressed at my results (if I even got past downloading the pattern – hehe!) that I will probably remain content to sit and drool over yours! 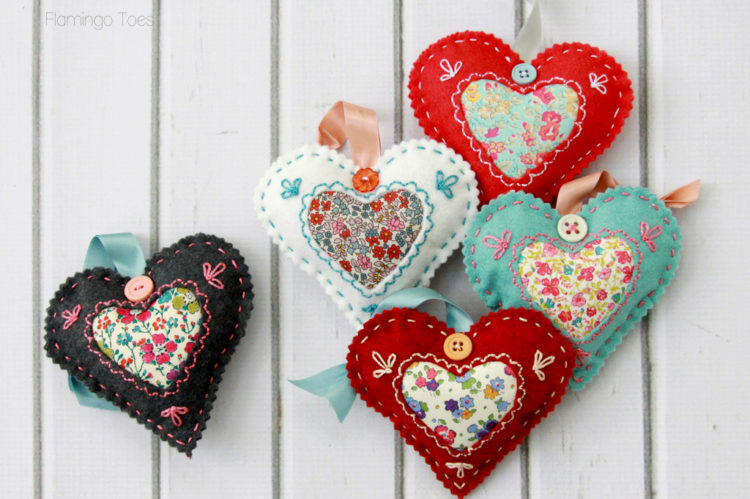 I just love these hearts! I love the embroidery! What is fiberfill and where did you get the dried lavender? These are adorable! I’ve included this idea in my blog post featuring Valentine crafts: http://abusylittlebird.com/8-great-projects-to-make-for-valentines-day/ Thank you! 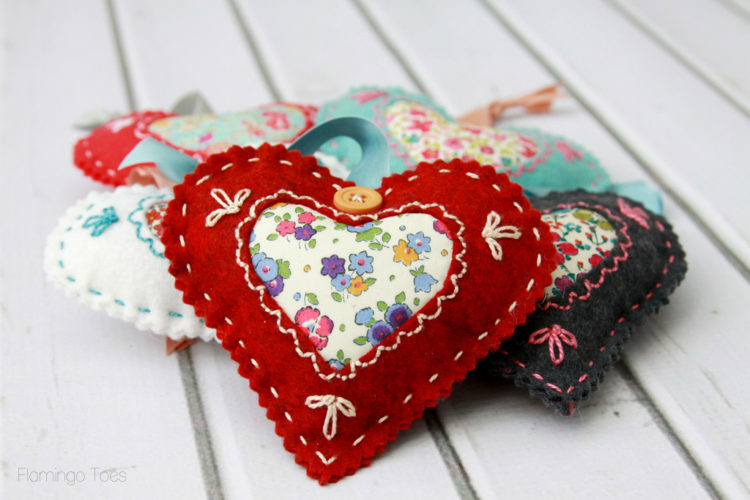 I Love these heart sachets and shared it on my Facebook crafting page with a link back to your page. Thank you! I love these little sachets! I am making a bunch and making them into a swag to hang in a window! Would you mind telling me where you found your mini-oinking shears? I don’t see them for fabric anywhere. Thanks for the tutorial, they are so cute. I am making lots of them. These little hearts are super cute. I’m going to make some for a few friends. 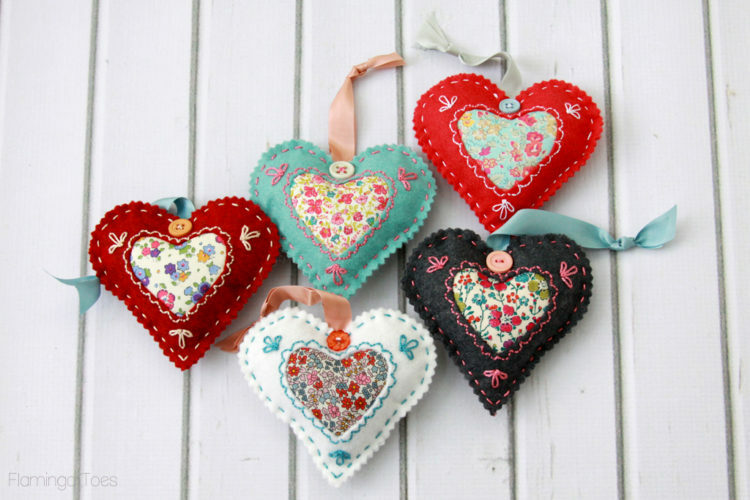 Just one thought….I believe it would be easier to sew the button on the front heart after the embroidery scallops and BEFORE sewing the front and back pieces together. I will try it both ways to be sure. Thanks!